Like Davinci’s Mona Lisa, John Pasche’s Rolling Stone tongue, Andy Warhol’s Soup Cans, and The Creation of Adam; The Great Wave of Kanagawa by Katsushika Hokusai is a painting that has far surpassed the title of a mere ‘artwork’. The distinctly famous woodblock printed work is universally recognisable and timelessly relevant, even to folks who don’t engage with art on the reg. The Great Wave, depicts three boats riding rough across huge foamy blue waves toward a tiny Mount Fuji, placed far off in the distance. It has inspired form and pattern in many other artworks, films, technology, and even couture fashion. Since it’s creation, somewhere between 1830 and 1834, it has emerged across many different facets of popular culture resulting in thousands of parody images that are brilliant and entertaining for the most part, and at times kinda boring and obvious. Fortunately for you, in light of the Hokusai exhibition opening this month at Melbourne’s NGV, we have decided to compile a curated list of the best times this famous print has been appropriated, to reaffirm your fondness for the Hokusai’s work in time for the show’s opening on the 21st. The retrospective at the NGV will include the gallery’s own ‘Impression’ of the print—there are several other editions in existence belonging to other well known galleries around the world; including The Met, LACMA in LA, and the British Museum. Also on display will be 176 additional works from Hokusai’s iconic series: Thirty-six Views of Mt Fuji; which despite being widely known now, initially took a long time to be discovered. The time that Hokusai first made these works, when Japan wasn’t as involved with the rest of the world as it is now, was is known as the Meji Era. It wasn’t until a good while after that, during the Post-Meji Era (as it is historically referred to) that Hokushi and other Japanese artists who were living and working at that time, gained the global recognition they deserved. 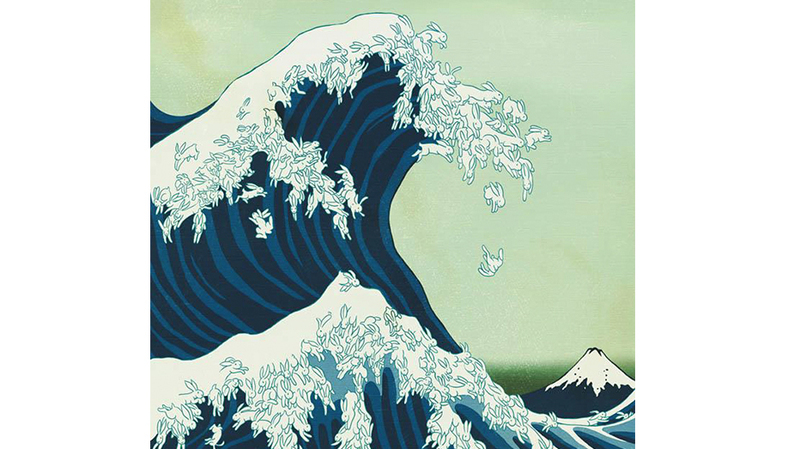 The Great Bunny Wave or Uprisings as it is formally known, is likely the most famous reiteration of Hokusai’s pre-modern wood block print. This digital rendition of the wave was made by Kozyndan, who are actually not one artist but two—a Japanese couple based in California. They originally illustrated this piece for the 28th cover of indie art magazine Giant Robot, but it then went on to become part of the artist’s famed Season of the Bunny Series, that grew into a collection of illustrations, depicting bunnies in various natural landscapes. 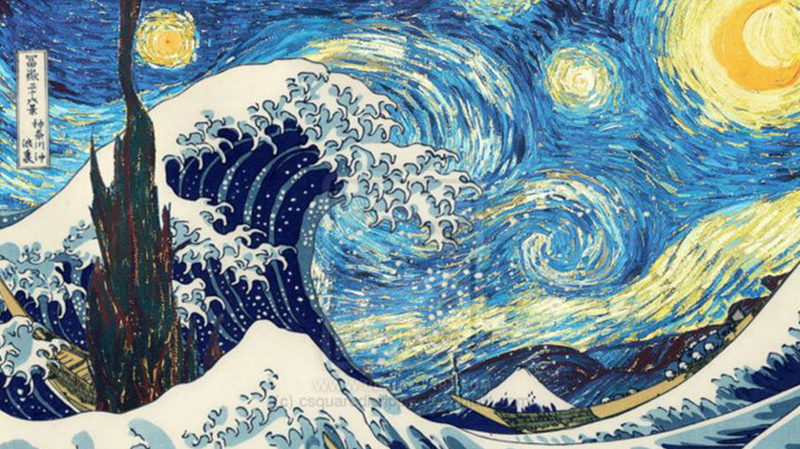 In a slew of Australian colloquialisms; Indigenous artist Lin Onus, named his version of The Great Wave: Michael and I are just slipping down the pub for a minute, presumably after the characters in what I am going to call: The Desert Version of the Great Wave print. Riding the water into the dusty horizon, painted in ivory, dirt red, and ash black—hallmark Australian outback colours, that here symbolise spiritual Indigenous motifs. The dog is juxtaposed with the outback setting and the Japanese wave, bringing together a scene that highlights the many differences in individual Australian cultural identity, and the emergence of stereotypes within those dialogues. Onus is known for including imagery and symbolism from both Western and traditional Aboriginal cultures in his work. 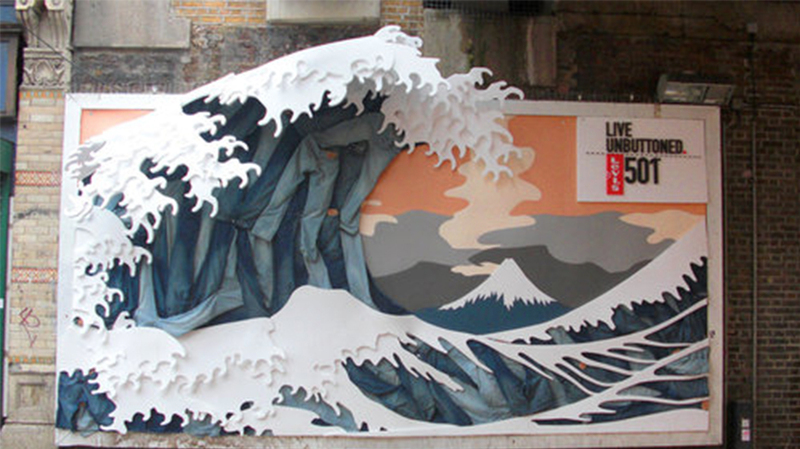 For Levi’s Live Unbuttoned 501 campaign in 2008, the brand created a three dimensional sculpture of the pre-modern artwork out of denim. Built from pairs of jeans; the cotton and cardboard waves jutted out of a billboard like structure on a street side wall in Japan. The piece was one of several different conceptual installations in various locations around the world. A second emergence of the wave in fashion was in the recent work of Russian designer Alena Akhmadullina. Her 2016 Resort collection features a pantsuit, trench, blouse and formal dress inspired by the blue wave patterns in Hokusai’s work. 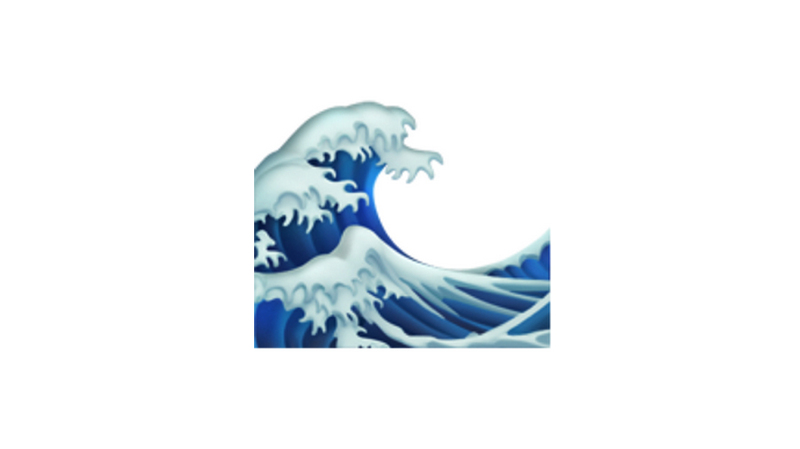 After all, how could The Great Wave of Kanagawa be a true icon in popular culture without it’s own emoji. 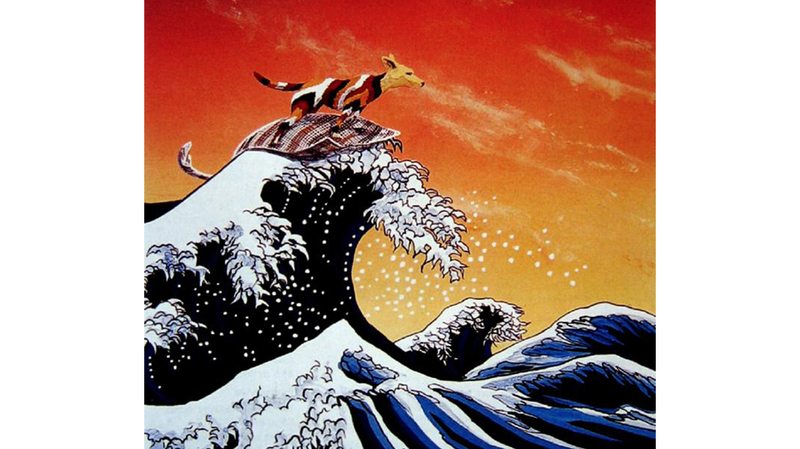 This is it: ?,, and yes it was actually created based on the original woodblock print by Hokusai. The film version of the painting is the most beautiful of all the examples to observe. Miss Hokusai is a manga series that is really well known in Japan. The Great Wave of Kanagawa scene shows three characters rafting through the waves of the painting, in front of a majestic cloudy blue sky backdrop. Slowing in motion as the mis-en-scene slowly grows closer in resemblance to the composition of the original image; the scene ends with the characters at the very top of the wave, showered in foamy droplets. 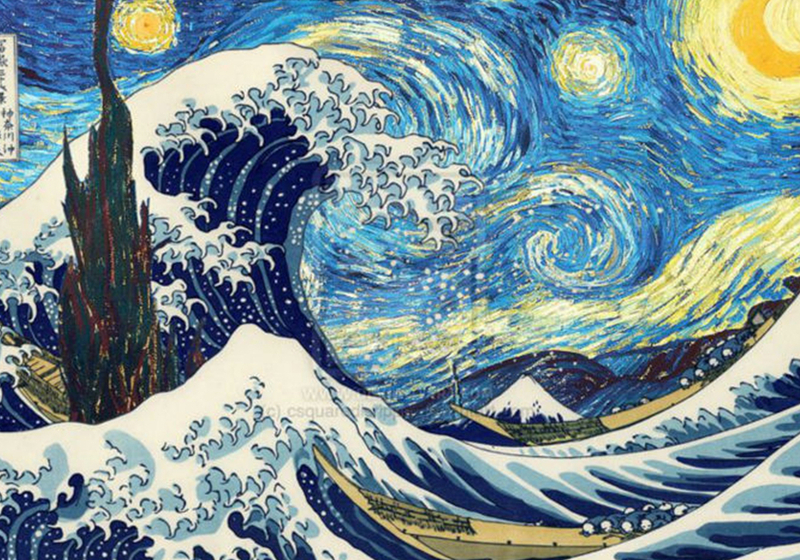 As Van Gogh’s successor to the NGV throne The Starry Night/ Great Wave Mash Up is the most serendipitous rendition for the occasion, in our list. Though the creator of this parody image is unknown, we can still appreciate the sentiment of seeing the two iconic paintings come together as one.